Heating your home can be a waste of energy and money - follow these simple measures to help you make sure you get the best out of your boiler and central heating. 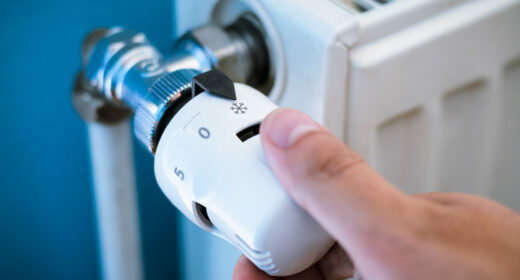 According to the Energy Saving Trust, the average household spends £1,300 a year on gas and electricity. The same three-bedroom semi-detached home could save more than £500 a year with better insulation. Double glazing improvements and expensive cavity wall insulation can all lead to a more energy efficient home. But one of the biggest savings can be made by making sure you have at least 27cm thick loft insulation in the attic as this can knock £140 off your annual bills. In the first instance though simply insulating where drafts are coming in – the letterbox and cat flap using a brush draft excluder– will also help keep you warm. DIY draft excluding foam strips stuck around windows and doors offer a quick fix. And heavy curtains closed against the cold night will act as insulation. Besides from fitting individual radiator thermostat valves that allow you to make sure radiators are only switched on when they’re needed, you can install state-of-the-art devices that make this kind of energy-saving and cost-cutting even easier. One example is British Gas’s Hive Active Heating. It connects a wireless thermostat to the internet to allow you to program your heating and hot water by text message or from any smartphone or tablet, and you don’t have to upgrade your boiler. It won’t save you oodles of cash, as it’s essentially a thermostat upgrade, but it will allow you to use energy more efficiently. For example, it’s geolocation function allows you to program your heating to come on when you get close to home. There’s no point investing in the latest technology if you’re boiler’s on its last legs. Get it serviced regularly – emergency repairs can cost a fortune, and servicing will catch problems before they occur. Most boilers last for around 10 years then they start to become inefficient and waste gas as well as money – so read on if you think you need a replacement. Make sure there aren’t any cold spots, which are caused by build up of debris in radiators. You can fix these with a “Powerflush” using a chemical solution that breaks down the build up. It costs around £500. You can also have a Magnaclean installed to prevent the pipes from becoming blocked again. This should cost around £200 on top of the cost of a new boiler. If you haven’t switched energy providers for a year, then what are you waiting for? By switching, families on average saved £263 a year. Switch now in 3 easy steps with the HomeOwners Alliance. Just click here to get started. This is really good advice. Thanks for sharing! We have written an article recently orientated around providing tips for people looking to purchase a new boiler. Please feel free to use the information in our article.